What is an ecologically or biologically significant area? How does the EBSA process work? What is GOBI’s role in the EBSA process? How can EBSAs be used in conservation planning? What is an ecologically or biologically significant area (EBSA)? EBSAs cover many different types of marine ecosystems in different regions: they encompass areas that have been shown to hold the greatest richness of species and productivity, possess rare or endemic species, or are home to unique communities of fauna and flora. To date, there are more than 321 EBSAs described around the world. They occur in all regions of the planet from the poles to the equator, and in all water depths from the coast to the deep ocean. They can be found in national waters, span territorial boundaries, lie partially or wholly within areas beyond national jurisdiction, and can even overlap each other. There is no minimum or maximum size for an EBSA: they can be small or cover vast expanses of the ocean. The flexibility of the EBSA approach reflects the dynamic and complex nature of the marine environment. 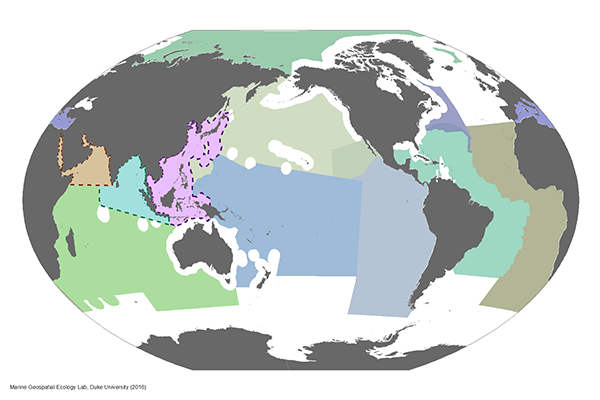 For example, an EBSA can be based around a single static feature, such as a seamount, or a collection of similar features, such as a chain of seamounts, where interconnectivity between the individual seamounts is critical for the overall health and survival of the local ecosystem. EBSAs may also contain a variety of seafloor features over a range of water depths that collectively provide important habitat for marine ecosystems. If appropriate, EBSAs can move position over time, and their boundaries can change dynamically in line with seasonal, annual or longer-term shifts in oceanographic or climatic features, such as seasonal changes in ocean circulation or patterns of sea ice. This allows the EBSA description to reflect more accurately the natural variability of its ecological or biological characteristics. The EBSA designation does not bring any management measures or restriction of activities – it is simply recognition of an area’s biological or ecological significance. However, the information used to describe EBSAs can also be highly valuable for conservation and management, for example in supporting the case for area-based management tools, such as marine protected areas or environmental impact assessments. Since 2012, a series of regional workshops has been convened around the world by the CBD to examine the information available to support the description of EBSAs. Scientific, regional and technical experts come together to source, discuss and assess the data available for a particular region of the ocean. This is a technical exercise, but as well as scientific data, other sources of information are taken into account, such as traditional knowledge which encompasses the knowledge, innovations and practices of indigenous peoples and local communities. The results are a series of technical descriptions of areas of the ocean that are considered important in the context of one or more of the seven scientific EBSA criteria. These descriptions are assessed by the CBD’s Subsidiary Body on Scientific, Technical and Technological Affairs (SBSTTA) and subsequently considered at the CBD’s Conference of the Parties. These workshops have generated 321 recognised EBSAs around the world. EBSA descriptions are kept in the CBD’s EBSA Repository, and are available online along with the official reports of the regional workshops. GOBI has provided strategic input into each stage of the EBSA process. Representatives from GOBI partners have participated in all EBSA regional workshops, providing scientific expertise, guidance and consistency in the application of EBSA criteria across areas, workshops and regions. GOBI partners CSIRO and the Marine Geospatial Ecology Lab (MGEL) at Duke University provide specific expert technical support for data collation and visualisation. The EBSA process is evolving. There is a renewed drive to update and strengthen the evidence base in support of existing EBSAs, as well as continuing to describe additional EBSAs during future workshops. Parties are also invited to include the results of their national EBSA-like processes in the EBSA Repository. In addition, EBSAs are to be assessed against four emerging categories: static, dynamic, grouped or ephemeral. Future consideration is to be given to the assessment of gaps in the representativity of EBSAs, especially in areas beyond national jurisdiction. The aim is to provide relevant ecological or biological information to support States and competent international organisations who can take management measures including the design and establishment of a coherent, representative network of marine protected areas that will help implement an ecosystem-based approach to environmental conservation and management. Some Parties to the CBD have already used EBSA descriptions to inform their national processes or to secure international funding to support further research. Competent authorities have also begun to incorporate information from the EBSA process into their management decisions. It is anticipated that EBSAs will play an important role in the discussions surrounding the development of a new international legally binding instrument under UNCLOS to support the conservation and sustainable use of marine biological diversity beyond areas of national jurisdiction. In the Atlantic work is underway to integrate EBSAs, Vulnerable Marine Ecosystems (VMEs) and High Seas MPAs with ‘Blue Growth’ scenarios. This will be taken forward by the EU ATLAS Project, with 12 case studies intended to demonstrate options for integration at an appropriate scale. Portugal is proposing the establishment of large national EBSAs on its extended continental shelf. These proposals have to be consistent with national marine spatial planning objectives and the development of indicators to ensure conservation and delivery against targets and measures set out by the EU Marine Strategy Framework Directive. In Mauritanian waters, EBSA data are being used to support the case at the International Maritime Organization to create a Particularly Sensitive Sea Area on the basis that biodiversity in that area is vulnerable to impacts from international shipping. In South Africa, a national process ‘Operation Phakisa’ has used EBSA data to contribute to baseline information as part of a holistic planning exercise resulting in conservation measures. The North-western Mediterranean Pelagic Ecosystems EBSA illustrates how EBSA criteria can underpin advocacy for detailed management options (further research, fisheries gear specifications, seasonal closures, MPAs).